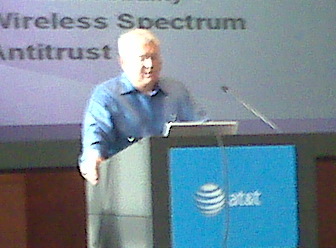 Jerry James, CEO of COMPTEL, updated the CLEC's and ISP's at FISPA about the major issues on the Hill and at the FCC. Besides, the National broadband Policy that is due by February 2010, the FCC has to make major decisions on the following issues: USF Reform, Forbearance petitions galore (Qwest in Phoenix, Verizon on the East Coast, AT&T wherever they can get it), Inter-Carrier Compensation, and Net Neutrality. Worrisome for CLEC's to say the least. There's also a bill about criminalizing Caller ID Spoofing. Ouch!